UPDATE: £200 32GB Google Nexus 7 confirmed, £150 less than iPad Mini | What Hi-Fi? Our sister site Stuff.tv has confirmation that there'll be a 32GB Google Nexus 7 tablet on sale for just £200 in time for Christmas. That makes it a massive £150 less than the equivalent 32GB iPad Mini. Stuff reader Conor Craig spotted a photo of the £200 32GB Nexus 7 in the Argos catalogue. It now seems highly likely that the 8GB Nexus 7, already out of stock at many retailers, will be dropped from the line-up. The 16GB Nexus 7 has already dropped to £170 at PC World, as we reported yesterday (see below). It seems that Google is playing hard ball with its pricing strategy, which begs the question: what wil be the price of the Samsung-made Google Nexus 10 tablet, due to be unveiled on Monday, October 29th? Ooh, this is interesting. 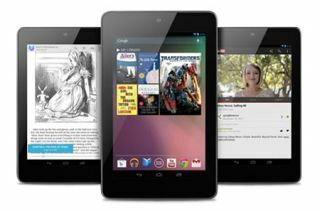 PC World is now offering the 16GB Google Nexus 7 – our 2012 Portable Product of the Year – for a full £100 less than the iPad Mini. It's dropped to £170, against the £270 16GB iPad Mini. There's been much debate since the unveiling of the iPad Mini earlier this week about Apple's pricing strategy, not least on our own Forums. Could that mean the 32GB Nexus 7 will drop to the 16GB model's previous price tag of £200? That would make it a £150 cheaper than its iPad Mini equivalent. It looks like an all-out price war in the tablet market may not be far off, although we don't see Apple dropping its prices any time soon. We'll have a Group Test of all the latest tablets in the December issue of What Hi-Fi? Sound and Vision, on sale from November 16th. It promises to be a fascinating test! Google is expected to launch the Nexus 4 at a press event on October 29th.